Home Android Top Email Apps Of The Year – Which One Fits Your Needs? 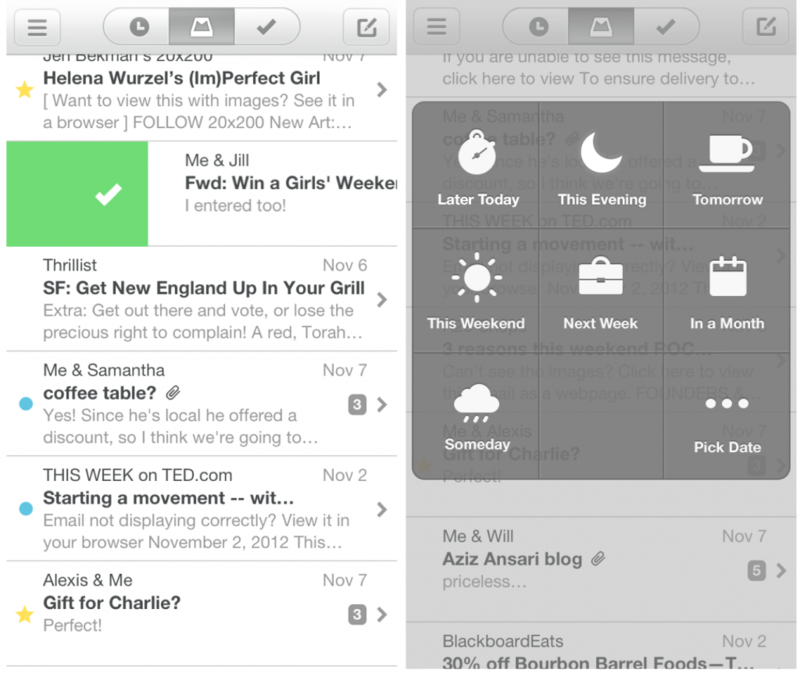 Top Email Apps Of The Year – Which One Fits Your Needs? There are a lot of email applications for Android, but not all of them measure up. Today we’re going to list what in our opinion is the top Android email applications, so if you’re unhappy with your current email application pay attention and we will give you a few more options to help cure those email blues. Blue Mail is free application that comes with a lot of features. When you receive a new email, you can simply swipe it to either mark or delete it then simply tap “Done” to complete the selected action. It allows you to snooze a specific email that you may have received for a set time then the application will notify you later. The snooze length is by default only three hours but can be changed as mentioned. The application supports many popular emails such as: Gmail, AOL, Hotmail, Yahoo and many more. 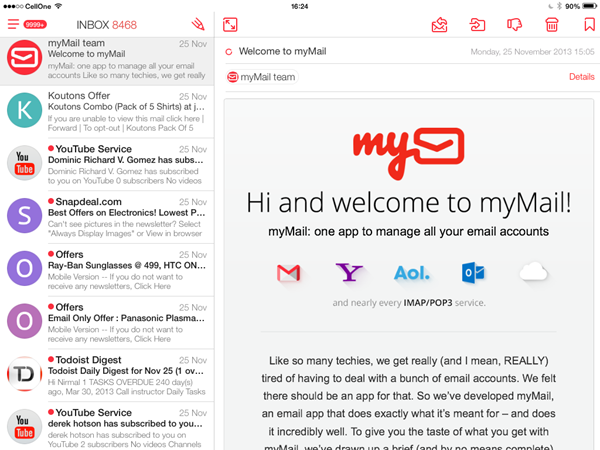 The myMail application comes with a simple straight foward interface, colored in red and black. The application comes with photo avatars for your email contacts, this allows you to figure out who sent you the email without having to read the name. The application supports Gmail, Yahoo, AOL, iCloud, Hotmail and most of the POP3 and IMAP email accounts. 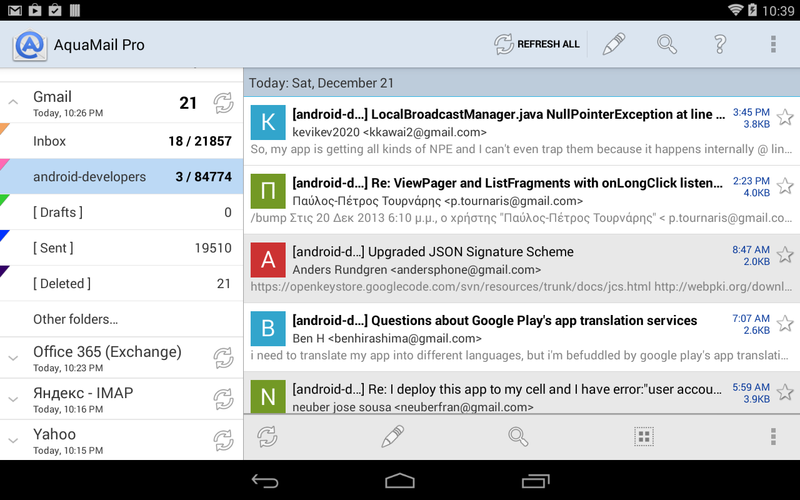 Aqua Mail is a free email application for Android. It comes with an intuitive user interface, you will figure it out only minutes of use. 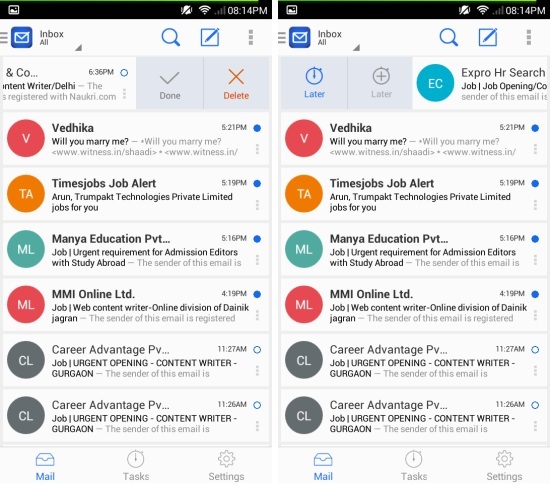 It comes with color coded labels thus making navigation very easy, it also allows you to collapse all the folders inside one email account, this makes life easier if you have multiple email accounts and you are searching for an email on a specific account. To make things even better, the application supports swipe gestures, which means that you will be able to reply, forward or delete emails very efficiently. Aqua Mail supports Yahoo, Hotmail, FastMail, Gmail, AOL, iCloud and more. Send Mail is another application that it is quite simple but at the same time it comes with pretty awesome features, such as real time push notifications, passcode logins and more. Send Mail supports email accounts from Yahoo, Gmail, AOL, iCloud and IMAP services. One of the best things about Send Mail is that it supports Exchange Server support (2003, 2007, 2007, 2010 and 2013), which this app may be perfect for business operators. 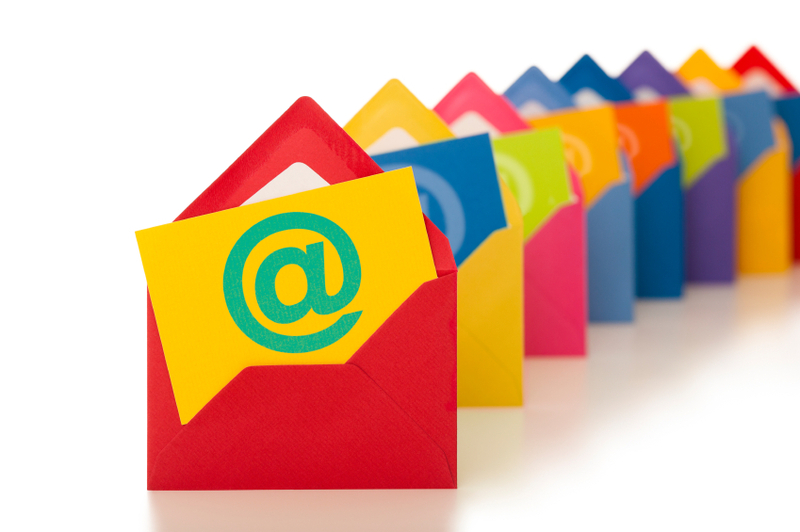 The CloudMagic application will unify your inbox with all your email accounts. The application supports Yahoo, Gmail, IMAP accounts, Outlook, AOL and many others. The application is very easy to setup and it comes with a nice and clean interface. 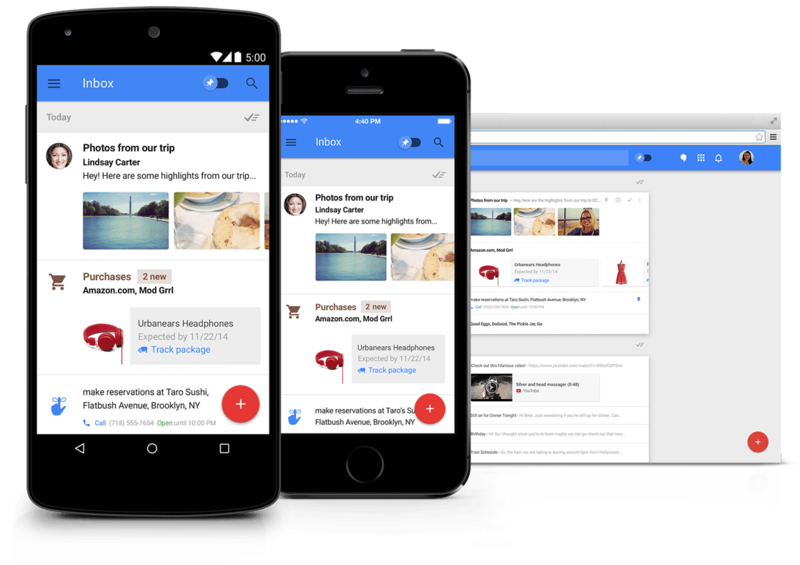 Gmail is probably one of the most used email services out there. The application has been around for years and there are a lot of people using it daily for both business and personal purpose. The downside of this application is that the application works only with a Gmail email account. 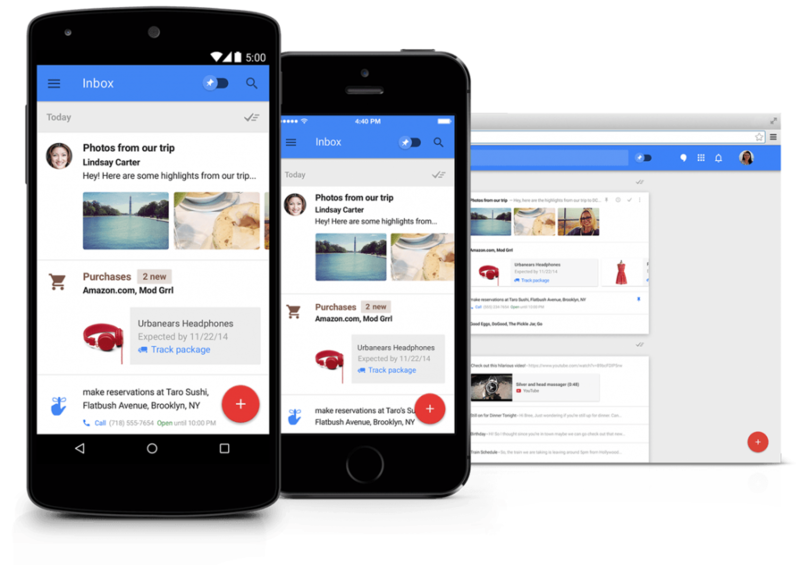 Inbox by Gmail is the newest email application developed by Google. This application was released a few months ago and it is currently available for both iOS and Android. However, in order to use this application, you will need to be invited, as it is still currently in BETA. – Search: Are you searching for a specific email? Don’t worry, because the search feature will help you find the email within seconds. The application works with Gmail, so all the messages you receive on Gmail are on this application also. A few years ago, Mailbox application was brought by Dropbox. This was one of the first email applications which made replying to emails very fast and easy. At the same time, Mailbox was one of the first applications that came with the swipe gestures, which many email applications currently use. The application also supports Gmail, iCloud and many other email services. 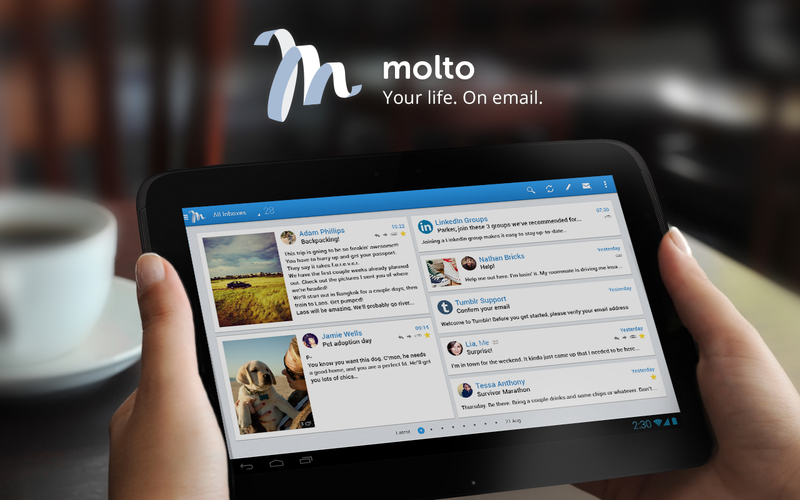 Molto is an email client application that looks very much like popular social media applications such as Twitter or Facebook. The application supports Gmail, Yahoo, Hotmail, IMAP and POP3 emails. Because of the design, we’re pretty sure that all Twitter/Facebook fans will enjoy using this email application. Next articlePhone Doesn’t Charge Properly? Don’t Worry, We Have The Answer!